Notes: Also try calling: Max Reichenthal, T: 713.672.7595, E: maxr@texasironandmetal.com Directions: Take West Loop 610 North exit Airline. Turn right onto Airline. Go three blocks down to Sylvester Road and turn left. Cemetery is one block down on the left. Parking is very limited. Directions to Kever: Adath Israel Cemetery in Houston, TX maintains computerized records and will assist upon request. 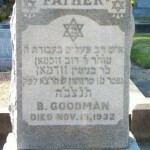 Rav Goodman came to the United States at the direction of the Cofetz Chaim. Where is the: “d. 25 Adar I, 1932 (5691)” coming from? The hebrew year is wrong – instead of 5691 it should be 5693 (which converts to Nov 15 1932). A Gimmel ג and the letter א are pretty similar when written quickly. I’m assuming that the engravers in those days were more affluent in English than Hebrew and mistakes like these make sense. 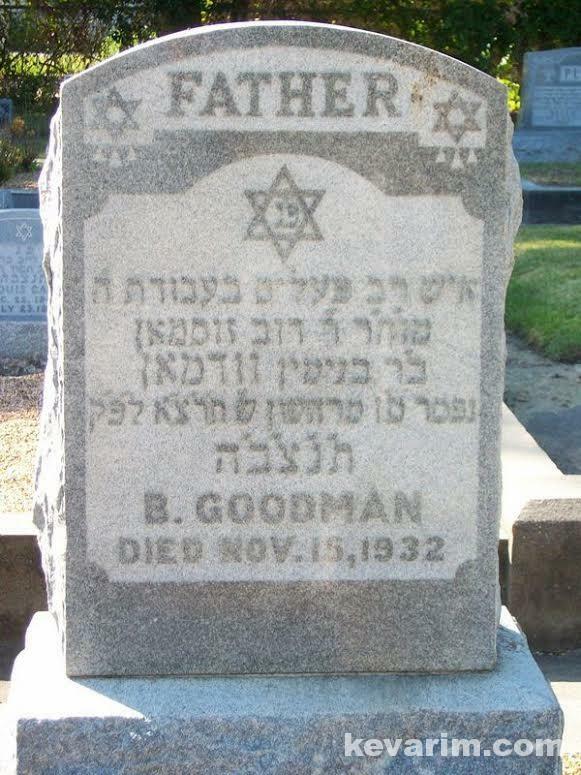 Someone forgot to ask – where does it state that he was a Rabbi? Talking about misspellings – can someone explain how this happened?